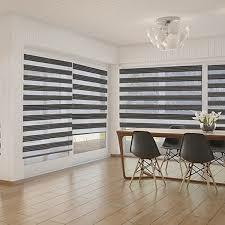 DC Shutters offers premium Zebra blinds to provide you with the best aesthetic and functional window treatments. A modern alternative to horizontal blinds, this style allows users to conveniently transition between sheer and diffused light, and modify privacy depending on their needs. These innovative blinds are constructed with solid weave fabric and sheer sun screen, which gives this product great light filtering features. Homeowners can block out incoming light by adjusting the blinds, so the fabric overlaps the sheer sun screen. Alternatively, when the sheer overlaps the fabric, the window covering allows light to enter your space. They are mostly designed with dual colour schemes for superior light control in comparison to any other window treatment. Zebra blinds are a great addition to living rooms as they enhance the aesthetic and functional beauty of the space. Zebra Blinds, also known as Vision Blinds or Transition Blinds are a very modern alternative solution to horizontal blinds and stylish window covering solution for any home. Zebra Blinds are similar in structure to the Roller Blind that allow you to transition between sheer and privacy. The blinds can be adjusted so that the 3″ zebra stripes line up-offering privacy, light control, and insulation. Adjust the blinds slightly, aligning the 2″ sheer fabric section to allow incoming daylight. Zebra Blinds are also known as dual Shades or Dual Sheers and are fabric window treatments made of combined opaque and semi-opaque fabrics. Zebra Blinds are called dual shades because of the ‘looping’ feature built into every rolling zebra sheer or blind. This is because the back loop or repeated opaque-to-semi-opaque fabric can be moved up and down to filter the amount of light that is let in through the semi-opaque fabric. This fabric transition and filtering differences of the vertical pattern in the sheer looks like the transitioning of the stripe pattern on the body of a Zebra Blinds. The unique design of the Zebra Blinds allows for the ultimate control over the view, privacy, light and style in the one blind. This makes them the perfect option for rooms such as living rooms, bedrooms and studies. With the light filtering fabric open, an ambient level of light can enter the room while maintaining privacy and when the sheer fabric is open, it is the perfect way to allow the natural sunlight to flood into the room. Zebra Blinds are easy to clean and maintain with strong durable fabrics and components. They are simple to operate, with a colour coordinated cord attached for easy transitioning of the fabric to the desired position. Why Shop for Zebra Blinds from DC Shutters? If you’re looking for an interesting twist on a traditional horizontal blind or a roller shade, then Zebra blinds are for you. Our Zebra Blinds collection has a wide variety of styles, colours, textures, patterns, and prints that complement different styles of home decor. 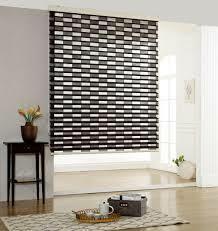 We also offer these blinds at competitive prices that you can find nowhere else across the GTA. At DC Shutters, we ensure that our branded products are the best quality available in the market. We focus on every detail including the quality of the fabrics, screens and side chains for smooth operation. Call DC Shutters at (416) 517-3315 for any product related queries or assistance. We provide superior quality window blinds, shades, and shutters across Toronto and surrounding areas of the GTA. Visit us at 23 Teal Crest Circle Brampton, Ontario L6X2Z6 Canada. Contact DC Shutters for Zebra Blinds in Brampton, Oakville, Kitchener, Waterloo, Hamilton, Niagara, Toronto, Richmond Hill, Aurora, Newmarket, Ajax, Whitby, and Oshawa.